The Trump administration on Thursday called for the privatization of the U.S. Postal Service, an agency with 600,000 federal employees and whose creation was codified by the Constitution. The White House made the proposal in its wide-ranging plan to reorganize the federal government. Privatizing the postal service was among 32 distinct ideas it said would help agencies run more efficiently. It first called for reforms to the Postal Service that would create a more sustainable business model, but those changes would be made only for leverage to then sell the entire agency to the private sector. The proposal comes as a task force created by President Trump is working on a series of reforms to put USPS on firmer financial footing, which it will deliver in a report by Aug. 10. USPS is continuing to expand its delivery network despite a significant decline in mail volume, the administration said, and can “no longer support the obligations created by its enormous infrastructure and personnel requirements.” The mailing agency is required by law to offer its services to every address in the country and has reported losses of more than $1 billion for 11 consecutive years. USPS is caught between its requirement to operate like a business with “the expenses and political oversight of a public agency,” the administration said. Major savings would stem from not just reducing services and more pricing flexibility, but by freeing the agency to “more fully negotiate pay and benefits.” The Postal Service currently negotiates pay and cost-sharing of benefits with labor unions, but is required to participate in federal health care and retirement programs. Its prices are capped and approved by an oversight body, the Postal Regulatory Commission, which the White House suggested could still exist under a privatization model. Another advantage of a private postal system, the administration said, would be access to private capital. The Postal Service does not currently receive any federal appropriations, aside from money the government spends for specific services. Privatization could occur either through an initial public offering or a sale to an existing company, the White House said. It said the reforms proposed by the task force Trump created would be implemented to stabilize the agency and better prepare it for its defederalization. That group has been meeting with stakeholders throughout the postal community for the last several weeks as it readies its recommendations. The proposal is unlikely to gain any traction in Congress, which is currently working through its own reform packages to help the cash-strapped agency. Lawmakers on both sides of the aisle have spoken to the importance of preserving a federal mailing system to ensure delivery to all Americans, even to areas that the private sector has decided is not profitable to service. Members of Congress representing rural areas have particularly pushed not just the preservation of the Postal Service but an expansion of its offerings. Lawmakers have not shown an appetite for reducing postal services, let alone privatizing the agency, intervening on a bipartisan basis in recent efforts by the agency to reduce the number of post offices, cut the number of delivery days and consolidate processing plants. The opposition to the proposal was broad and swift. The National Association of Letter Carriers said the proposal has rendered Trump’s task force effectively moot and ignores the interests of every postal stakeholder aside from private shippers. NALC, along with the other major postal unions, has met with the task force and submitted its ideas for putting USPS on a better path. “Now that we know that this administration and its Task Force will make recommendations on reforms to achieve OMB’s privatization goals, NALC will work tirelessly with other stakeholders and Congress to oppose this faulty privatization plan every step of the way to preserve this public service,” said NALC President Fredric Rolando. Art Sackler, who heads the Coalition for a 21st Century Postal Service, a group of large-scale mailers such as Amazon, eBay and the Parcel Shippers Association, said his members were “very, very concerned" about the Trump administration's proposal. 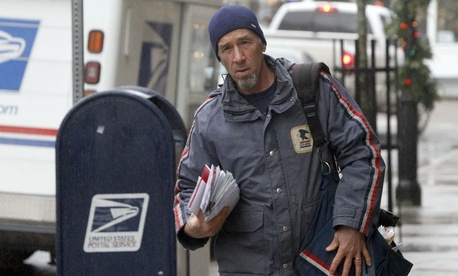 Mark Dimondstein, president of the American Postal Workers Union, said the plan was marked by misinformation. “Privatizing the Postal Service is not in the public interest and would be nothing more than a raid by corporate pirates on a national treasure,” Dimondstein said.